Click this link to acknowledge this notice. Inspiring and empowering researchers to proactively engage with their professional development and career planning. How to use the RDF? The interactive Vitae RDF wheel below is divided into various sections to ease navigation. 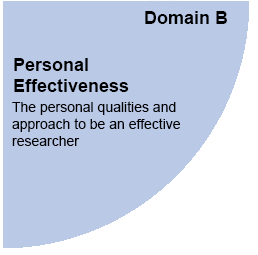 There are four domains, each containing three sub-domains, providing twelve broad areas of skill development for you to explore. These twelve areas are broken down in to 63 descriptors that are designed to really focus your skill exploration. As you enter a descriptor, you will find a summary of the phases of capability on the left, in order to help you rate your current and desired level of proficiency. Remember it is not vital to be at ‘phase 5’ for every skill area! 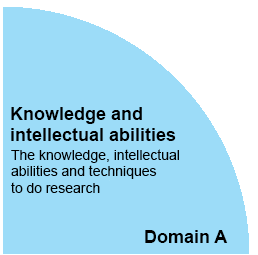 Each descriptor has resources in the forms of documents, videos and links for you to explore in order to improve your awareness of that skill and to begin your personal development. 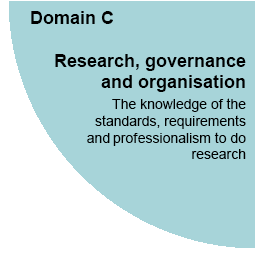 Vitae has developed ‘lenses’ on the Vitae Researcher Development Framework (RDF). 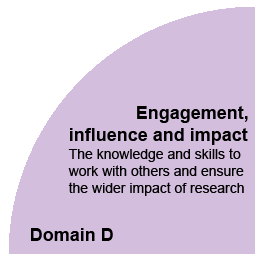 The lenses, focus on knowledge, behaviours and attributes that are developed or acquired through, or used in, the broader contexts of being a researcher. Looking at professional development through a lens can help researchers strengthen their academic profile or prepare for transition into a new area of work. Click a lens to view the skills on the RDF wheel through the lens, or click a chevron () to learn more about a lens. Clicking the eye symbol () will clear the lense visualisation. To discuss your development after using this online resource and to find out more about what is available at The University of Sheffield, please contact the Researcher Professional Development team using the Think Ahead link. You can also click on the calendar icon in the top left corner to find out the dates of relevant development events. The symbols %eye & %chevron will be replaced with & respectively.